The Virginia Tech Transportation Institute found that people who text and drive are 23 times more likely to cause an accident than when giving their full attention to the driving. Numerous studies have found that distracted drivers have reduced reaction times and take their eyes off the road on par with drivers who drive under the influence of alcohol slightly over the legal limit of .08 percent blood alcohol content (BAC). When you text and drive, you’re essentially driving drunk. 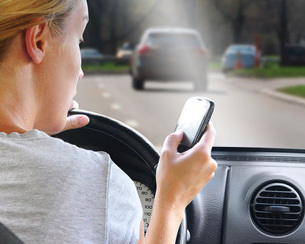 We hold distracted drivers fully accountable for the terrible injuries they cause to our clients in Manassas, Prince William, Manassas Park, Gainesville, Haymarket, Woodbridge, Lake Ridge, Dumfries, Bristow, Warrenton, Centreville, Fairfax, Stafford, Chantilly, Leesburg, Ashburn, Sterling, Herndon, Reston, Alexandria, Annandale, Arlington, and throughout Northern Virginia. How Can Carluzzo Rochkind & Smith, P.C., Win Your Case? We will customize your case and invest the full resources of our firm to investigate, build, and establish the full and fair value of your case. We relieve you of legal burdens and handle all communications with insurance companies and adverse parties. We allow you to focus on physical, psychological and financial recovery. DO NOT accept an initial settlement offer from an insurance company, and DO NOT say anything more to an insurance adjuster before speaking with a highly experienced personal injury attorney. Speak with one of our attorneys who handles distracted driving accident cases today. Please contact us by email or call us at 703-361-0776 to schedule a meeting. We handle all accident cases on a contingency fee basis, and we look forward to speaking with you.